Every year I try to take some time to evaluate current fitness trends in the general public and in the fire service. I have been very fortunate to have some great connections in both industries, based on my research and numerous conversations with colleagues, I’ve identified some of the fitness trends we are most likely to see in departments this year. You would think that the correlation would be almost the same, but the budget restrictions and the fire service’s (sometimes) resistance to change can hinder progress and slow popular fitness trends. Another reason the popular trends you see in your health club may not make it to the fire services is due to workout outcomes. People in the health club are primarily working out for aesthetics and improved health while firefighters, EMTs and medics are (or should be) working out for performance, overall health and then for the six pack abs. The trends listed below, although not an exhaustive list by any means, represent opportunities for you, your crew, and your department to increase your physical readiness and improve overall health. 1. Flexibility and recovery. If you are a fire rescue athlete and you are not performing an active warm-up, using a foam roller and/or stretching after and at some point throughout your week, you are wasting time! Flexibility and recovery help athletes “move” more efficiently, recover quickly and improve strength. When I was training one of my first fire academies we were limited on equipment so I placed a lot of emphasis on bodyweight and movement. Low and behold, all of the recruits improved deadlift strength and bench strength throughout the 16 weeks, even though we didn’t lift a single bar. My point? The smart fire rescue athletes are realizing that working on moving better in the gym transfers to moving better on the fire/rescue scene. You will see more foam rollers, yoga poses for firefighters, and stretching programs, embrace them and realize although not very “manly” they can really help. 2. Injury reduction programs. Budget is usually the biggest reason why fitness remains a side budget item at most departments. Everyone including Chiefs know it will help but when it comes between putting new tires on the engine or sending members for fitness education, the tires win. One way to help fund the fitness movement is to reduce time lost wages due to injuries. Departments are now hiring athletic trainers and physical therapists to help create programs to prevent injuries and decrease the severity of them. There are also some very innovative companies that will work with departments to create ways to cut-down on red tape and get injured fire rescue athletes recovered faster. One of the companies, TAHPI (https://tahpistrong.com/), is working with my current department and has created and an orthopedic network to help navigate and rehab injuries more efficiently. TAHPI (The Tactical Athlete Health & Performance Institute) believes that firefighters should be treated like professional athletes and creates a network of health professionals that focus on keeping fire athletes fit for duty. You will hear a lot more about these services in 2018 and in the future because they can actually show cost savings for departments. 3. Interval training/HIIT and crew workouts. Interval training has gained a lot of popularity in the sports conditioning community and has been a growing trend in group fitness. High-intensity interval training (HIIT) is characterized by intense bursts of exercise followed by short rest periods. Some experts believe that HIIT is a more efficient form of exercise that can minimize time spent at the gym. This type of training is very applicable to what firefighters do on the fireground. Lots of recent research studies have demonstrated the effectiveness of interval training. It boost metabolism, improves aerobic and anaerobic capacity, burns more calories than longer-duration/lower-intensity workouts, and can even improve cholesterol profiles. It is also very beneficial for firefighters to help prepare their bodies to go from “0 to 100” at a moment’s notice. This is a popular type of training to do with your crew at the firehouse. Working out with your crew can not only lead to better fitness results, but also add camaraderie and help you work better as a team. Hopefully some crews in your department are or will be doing some interval workouts this year. I included a workout below to help you get started. Here is an example of an interval workout you could try with your crew. Start with a 5-minute active warm-up that increases mobility and gets a sweat going. Next, set up five or six functional exercises, like sledges on a tire, drags, crawls, stairs burpees, and/or a core exercise. These movements can be performed for reps (10 to 15) or for a specific amount of time (30 seconds) with minimal rest between them (30 seconds). Try to repeat the circuits three or four times for a great workout in under 30 minutes. Be creative, you could add different exercises, perform the workout in gear or even on air. Looking for a great workout program that includes workout calendar, crew workout options, eating guidelines and simple ways to get lean and strong? 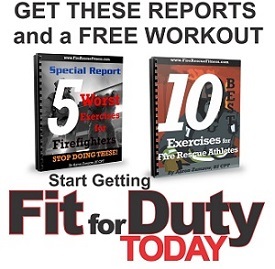 Click here to check out the GET FRF (Fire Rescue Fitness) Workout Program. 4. Simple fitness equipment. Fifteen years ago fire departments were getting grants and able to put large amounts of funds towards fitness equipment. Unfortunately today, those grants are harder to come by. The good news is that a lot of that expensive equipment is not necessarily needed nor the best options for firefighters. These machines, like the leg press, pec deck, chest press and shoulder machine press actually don’t fit the natural movement patterns of the joints they are supposed to work and promote bad form and injury. So, instead of spending money on them, the trend is to get rid of them. What departments seem to be doing (or should be) is getting equipment that promote “firefighter”functional, core strength, power and cardiovascular fitness. Personally, I think the best firehouse gyms are those that have minimal equipment and enough room for the entire crew to workout together. My current firehouse fits this model. We have a TRX, some plate weights, a sandbag, a tire, some cardio equipment and plenty of room for the entire crew of six to workout. 5. Cooking/ eating healthy in the firehouse. With the emphasis on fitness there is also an emphasis on better nutrition. There are a lot of resources available via cooking apps and websites that provide healthy recipes and even cooking lessons. As mentioned above, firefighters, EMTs and medics are just like athletes and need to be physically and mentally ready and need to fuel our bodies to help with performance. Firehouse cooks need to also acknowledge that fact and prepare meals that are not only tasty but healthy as well. This is a difficult task but one that is gaining popularity. One of my more popular posts this last month was about healthy snack options for firefighters. You can read that post by clicking here. The popularity of the post made me realize that there is a demand to eat healthy and I think you will see cooks follow suit (or should be). If anything firehouse cooks should be offering a healthy option for each meal. Personally, I always try to have a salad option available and put veggies on the table and the cakes and pastries in the cupboards. The fire service is usually a little apprehensive to grasp newer trends and is a little behind the times when it comes to health and fitness. Many firehouses probably still have the big multi-station gym, broken down fitness equipment or no equipment at all. The good news is that the trends identified here don’t require a lot of equipment nor money to implement. So, for 2018, think about stretching a little more, staying injury free, doing some crew intervals, getting rid of that old equipment and eating healthy. Your body and career will thank you. Stay safe and Get FRF in 2018!